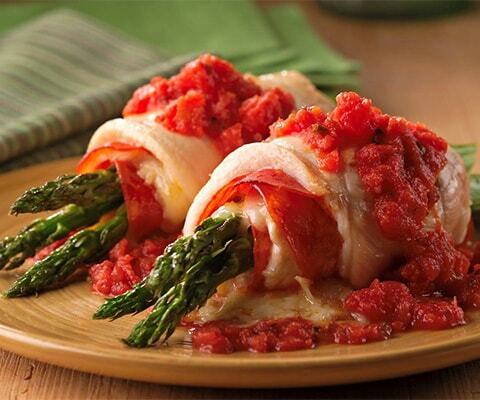 This delicious chicken dish is smothered in parmesan cheese and rolled with mozzarella and prosciutto and baked in white wine. 1/4 cup shredded Parmesan or Romano cheese. Slice each chicken breast in half and pound until about 1/4-inch thick. Season with salt and pepper if desired. Place 4 salami slices and one cheese slice on top of each chicken breast. Place 3 asparagus spears in center of each and roll up, securing with a toothpick. Evenly spread 1/2 cup of pasta sauce on bottom of an 11x7 baking dish. Arrange chicken in baking dish, top with remaining pasta sauce and sprinkle with shredded cheese. Bake uncovered for 30 to 40 minutes, or until cooked through. To pound chicken, place meat between two pieces of plastic wrap. Starting in the center, pound meat to reach an even thickness. If a pounder is not available, use a rolling pin. Am I missing something about this recipe?! There is no mozzarella, prosciutto or white wine any where in this recipe. I'm not the best cook in the world but this recipe is so easy to follow and turns out delicious every time! My husband loves it and I've made it for friends. They were so impressed! Great recipe!